Amazing use of space,love it !!!! La Fonda Olive? - Handsome light neutral green! Just double-checking, it's La Fonda Olive from Valspar? I picked up a color card from Valspar, and the photo seems much lighter than that. It's probably due to the lighting. 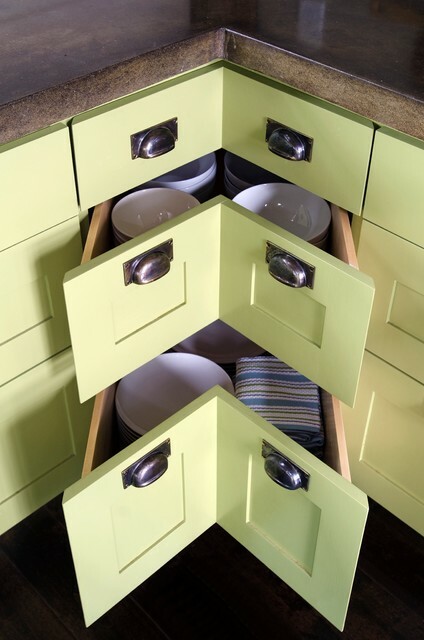 Love the drawer hardware! - Can you please give the source and style of the cupped drawer pulls? Thank you for your quick answer! Appreciate your time. tina, droo zako nzuri sana, nazipenda ! ( swahili from Tanzania) means, the drawers are very nice , I like them! Had i got the sketch i would try make it myself. Not a question, just a compliment! - What a marvelous solution to interior corners in cabinetry- and done with Kristina's usual sense of style and panache. Love it! Cabinets - Who made the cabinets? What material are your countertops? And what color? I love the depth. Dealing with kitchen corners is always a tricky business. Crestin solved the age-old problem with corner drawers made with angled fronts. 7. Make corners accessible. Blind corner cabinets won’t cut it. Yes, they provide ample storage space, but too often they turn into unofficial junk bins when you tire of getting on all fours to fetch the dish you need. Performing that bend-reach-lift motion also isn’t good for aging backs. Look for corner cabinet bases that effectively eliminate the need for rummaging and reaching. They aren’t all the same, though. You have options, be it a convenient three-drawer base (left) or a traditional Lazy Susan. Make corners accessible. Blind corner cabinets won’t cut it. Yes, they provide ample storage space, but too often they turn into unofficial junk bins when you tire of getting on all fours to fetch the dish you need. Performing that bend-reach-lift motion also isn’t good for aging backs. Look for corner cabinet bases that effectively eliminate the need for rummaging and reaching. They aren’t all the same, though. You have options, be it a convenient three-drawer base (left) or a traditional Lazy Susan.